You can learn more about GDPR at their official site. First, when fans navigate to a Feature.fm landing page, they will be asked to consent to cookies or can manage their permissions to opt out. At any time, fans can navigate to a dynamic Privacy Settings tab to manage their permissions settings or opt-out completely. GDPR requires fans in the EU to explicitly opt in to receive email messages from Feature.fm's clients who are the Data Controllers. After a fan takes an action that may collect their email address, they are presented with an option to opt in to receive future marketing emails. Feature.fm will not collect the email or names of fans who do not opt in. To view your list of fan email addresses in your Feature.fm dashboard, Feature.fm is implementing a 2-Factor Authentication log in process that verifies your identity to protect fan data. When you view your list of emails in your campaign or audience tab, you'll notice that there are some users that are listed anonymously. These are fans who did not opt in to receive emails. Feature.fm customers are allowed to email fans who have opted in. Any email addresses that you are able to view are from fans who opted in. If a fan later opts-out, then their email address will updated to be anonymous. 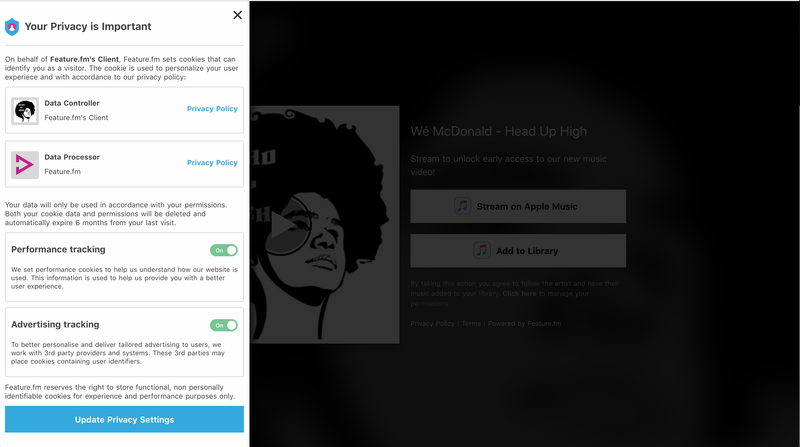 Feature.fm is committed to protecting customer data and privacy. All founders of Feature.fm are graduates of the Mamram Unit in the Israeli Army and have extensive backgrounds in Cyber Security and Data Protection. Feature.fm only uses trusted and certified compliant data-centers that carry certifications, including ISO 27001 and SOC. Feature.fm is continually investing in our own and our partners security infrastructure. Feature.fm is currently in the process of obtaining a SOC-2, Type II report, anticipated to be completed within 2018. Feature.fm will self-certify with the EU-US Privacy Shield within the 3rd quarter of 2018. All data is encrypted in transit using SSL and at rest using industry-standard AES-256. 2-Factor Authentication is required for Feature.fm Customers to access or view PII. Advanced Intrusion Detection and Intrusion Prevention Systems are implemented within the infrastructure to detect and prevent data breaches. For more information, please contact privacy@feature.fm.